Photos, art – and a little bit of LIT. For my walk with Jo this week I am taking you on a little stroll along the beautiful waterfront in Buffalo, New York. These photos were taken in 2007, when my husband and I took a sunset stroll in downtown Buffalo. but it is also noted for some other things! The origin of the name Buffalo is from the French words beau fleuve, meaning beautiful river. And there really ARE days in this town when you do not shiver…. 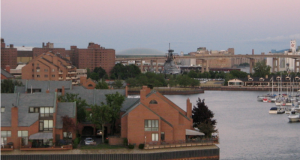 Buffalo’s waterfront is also home to several decommissioned US Naval vessels, which are part of The Buffalo and Erie County Naval & Military Park. One of the days we took a group of kids to this playground that was in a “decent” neighborhood. Seven of the cousins were playing that day- while we were chatting with grandma in the shade. Suddenly, we heard my nephew “sounding out” some inappropriate terms. We did not realize that there was swear word graffiti up on the slide and once we realized it – we left! It was time for lunch anyway, but this photo reminds me of how much we laughed that day – because my nephew was confused – he was a new reader at the time and he was completely bewildered as he was sounding out a few of the words… and we were shocked by what we heard…. For more walks with Jo – check out her blog HERE, where this week Jo takes us to visit Studley Royal. October 11, 2014 at .. So funny about your nephew sounding out the swear words! Great photos but my top pick is the riverfront one. The angle and perspective leave me feeling as though I have walked there. Love a town (city?) that’s built on the water, and beautiful river sounds like a good name to me. Speaking of sounds, I’m waging music wars with the neighbours, Yvette. 🙂 Your taste in music is much better than theirs and I’m sitting in the garden mingling the music. Can’t believe that it’s warm enough this Autumn afternoon to sit outside! Not walking you will note (for once). Thank you very much for the walk. I enjoyed it 🙂 Happy weekend! Gorgeous pictures, Yvette! I couldn’t begin to pick a favorite. And, as always, I love your taste in music. Goo Goo Dolls are a fav! I have heard about the cold weather of Buffalo, I bet the rest of the year is beautiful there. This sunset of the waterfront is gorgeous! Enjoyed the walk with you, Y! October 13, 2014 at ..
well here is another buffalo tidbit – the term “shuffle off to buffalo” is famous! The song was made famous from the 1933 musical film 42nd Street. October 12, 2014 at ..
I’ve always wondered how Buffalo got its name. Now I have a theory. Buffalo also has a nice little zoo, if I remember right, and a very nice science museum. I’ve been thinking about taking the kids cross-state (a sixish hour drive from here in Saratoga County) I’ll be postig some pictures, if I do,..
anyhow, look forward to seeing your pics if you take the trip. I wish Buffalo was six hours from me because I would visit more – but from where we are it is a horrible (winding and hilly) 10 to 12 hour ride -but at least we are within driving distance because in CO we were not! October 16, 2014 at ..
And thank you – because now, if we go, I have even more options for things we can do! oh… so you really “know” snow! But these are very beautiful. ha! – and yeah snow is like a synonym for Buffalo – and so many times when we see the national weather – there will be snow flake images over that region, or thunder bolts, wind icons, etc. – and we just shake our heads – it’s not fair! and when I hear “buffalo” I also think of the Bukhorn Exchange in denver, CO – where they have these best Buffalo steaks in the country! Ring the lunch bell! Mexican beef and buffalo burger please! That sunset is definitely amazing! yeah, seems sunsets can be on a lake, pond or ocean – but they never get old when they have that “dusty” color – ha! Thanks for the lovely walk, Yvette. Those old naval vessels are really something, aren’t they? Your sweet little nephew was just practising his reading, but it gave you all a shock. 😀 Funny story. Thanks from dropping by S- and Norfolk VA also has some vessels that can be toured – 🙂 – but no tiled roofs in WNY of VA – not like what you have in that sunshine state! Pleasantly surprised, about Buffalo. I am one of those who have always thought Buffalo was an industrial city, not appealing. This was a great post. I don’t follow any other blogger that takes me to so many different places. Remember Dr. Seuss’ book? “Oh, the Places We Will Go!” Later. thanks so much T – 🙂 and Buffalo also has great people – and the story of Jim Kelly says it all – he hated being drafted by the Bills – finally conceded and signed to play = and he now still lives there to this day! Yvette, I’ve been away from my computer for a day or two so a little bit late getting here. |A very, very big thank-you for linking to my post, my friend 🙂 Totally thrilled that you did that. I like the idea that Buffalo means Beautiful River, too. Your photos certainly show it off. It looks very serene and peaceful compared to wild and windy Wellington. So funny about your nephew! Hi Jill – well hope you had a nice break – and Wellington looks gorgeous too – and someday we can exchange weather stories – you can tell me about the “Welly quake” and I will tell you about the Buffalo Blizzard of 1977 – when the national guard came in to help out – not knowing more snow was coming…. Oh my goodness! We do get some snow in NZ but not where I live. Interesting walk Y love to stroll along a river. Did you try any of the famous and yummy Buffalo Wings? Hi Pomme, well I grew up there and so I had chicken wings a lot – I grew up eating five cent chicken wings, SAHLEN hotdogs, genesee beer (yuck now) and the best sandwich ever = “roast beef on weck” – mmmm it is layers of fresh roast beef (a bit rare) on a salty kummelweck roll- served with au jus – and it is perfecto! The salt of the roll and the tender meat are a taste that is unique! I will need to do another post on Buffalo … maybe a post about the food there! and side note, one of my husband’s favorite thing to do when we visit Buffalo is to EAT. He thinks the food in Buffalo is so amazing because of all the snowed in days they have to work on food. ha! But he really loves chicken wings and they are everywhere there! What unusual sounding food you have over there Yvette, whatever is weck??? and a salty kumelweck… (google doesn’t recognise them either!!!) You’ll have to do a post about them. October 14, 2014 at .. Funny story about your nephew. It really is a pretty waterfront. I was amazed at the size of Erie – not what I was expecting. Thanks for sharing enjoy your visit. I have some v. good chums in Buffalo, so it’s great to see these views of the places they took us when we visited. Thank you. Beautiful Buffalo! I am wondering how the chicken wings taste in Buffalo.. Buffalo chicken wings are certainly very popular worldwide and delicious! Thank you for sharing this beautiful post Yvette! Have a great week!! But the colors were wonderful and I was unaware of the naval museum there. I see the USS Sullivan is there, named after the Sullivan Brothers of WWII. October 17, 2014 at ..
October 26, 2014 at ..
Monday Morning Blooms – 13,000 Daffodils, oh my! Monday Morning Blooms - 13,000 Daffodils, oh my!